When I first thought of writing this post, I couldn’t make up my mind on what I wanted to talk about. Was it to be about using a luscious cotton yarn (that I love so much), about the incredible patterns you can make using only single crochet, or how washcloth patterns are really just “samplers” of your talent? Then I realized it should be about all 3! I often pick up yarn and just start crocheting, having no idea of what I am going to make. 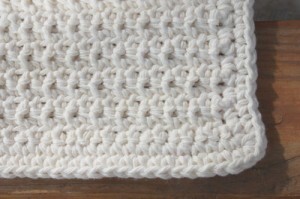 This particular day, I reached in my stash and picked out a ball of “Sugar ‘N Cream” cotton yarn in an off white color. I LOVE cotton yarn! It doesn’t stretch, it’s super absorbent, it’s natural, keeps its shape, doesn’t pill, and washes well. What’s not to love? I especially love it in whites and creams – it just seems to have a natural vintage flair to it without making it “old fashioned”. When I look at an item made from a run-of-the-mill acrylic yarn, all I can see are the fibers tangling up and matting. Cotton doesn’t do that. It gives your stitches definition because the fibers stay put. You can wash your items a thousand times, and the colors may fade (adding to the character), but it won’t look like your cat uses it as a scratching post! It’s also the perfect yarn for making washcloths and dishcloths. 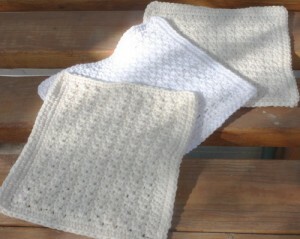 Here are three washcloths that are made only from using a single crochet stitch in various patterns. And the third was made by alternating a single crochet in the front loop, then a single crochet in the back loop. All are three very different patterns, as you can see, using only the very basic single crochet stitch. The list is endless on the variations. It is the tightest weave you can get in crochet and creates a heavy fabric, so it should only be used for items that you want to be thick and sturdy. Perfect for washcloths! It takes more time to complete an item since the stitch is small, but the result is often stunning. Just the slightest variation in your pattern creates an entirely different look. Playing with pattern variations on your own is one of the best things about crocheting. Every pattern under the sun is probably in a book somewhere, but when you’re free-wheelin’ it, who wants to dig out books? The best way to “play” is to just start crocheting what feels good. And the best item to do that with is a little square – a sampler. And what better item to make with that square than a dishcloth? They whip up in about an hour, you can throw a plain border around them, and you have a little work of art. You can make a set of three (as I just did), in 3 different patterns, throw a little ribbon around a stack, and you have an awesome gift that ANYONE would love! Add some in different colors and really WOW them! A little ribbon on a “stack” makes great gifts! Here is a photo from my personal website. These were sold at a craft fair I attended last year. I think the packaging really helped sell these – they looked even cuter in person! Everyone I knew received a set for Christmas and they all loved them. To the recipient, these washcloths EXUDE your talent! When made in several different patterns, people think you’re a crochet professional! And only YOU will know that you used ONE, very, very simple stitch, with a simple yarn, for a simple item – and made something beautiful. If you enjoyed this post or have any questions, please feel free to leave a comment! This entry was posted on Wednesday, October 17th, 2012 at 8:56 AM by Corinne Munger	and is filed under Fun Ramblings, Tutorials and Help. You can follow any responses to this entry through the RSS 2.0 feed. You can skip to the end and leave a response. Pinging is currently not allowed. Hi, I love these washcloths. I’ve been knitting some but love the look of the crocheted ones. Do you have a basic pattern you have written out? Like how many stitches to start a foundation chain? What size hook and the basic beginning and ending of rows? I still get those things a bit wrong when I’m crocheting. Thanks! Hi Yvonne! So glad you like these! They are so much fun to make! The patterns are being put together and will be available on this site in a just a few days! Let me know if you need help with them. 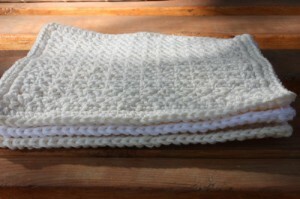 Would love to have your pattern for the washcloth sampler. They are just great for gifts. Hi Phyllis, The pattern will be available here in the next few days. These do make really wonderful gifts (and be sure to make some for yourself!). You can usually get 2 cloths from one 4 oz. ball of Sugar’n Cream yarn so these are about as inexpensive to make as can be. Thanks for writing! I also love you dishcloth pattern…I just emailed Racheal asking her for the pattern…She did email me back and said you were gonna post them…I am so glad..I want to make some for christmas gifts,,,Nice work!! Thank you so much! The patterns are in the editing phase and should be available very soon! Oh cool can’t wait to get he patterns…Where will they be posted..
I’ll notify everyone on this thread and it will also be posted on the home page of the website! please notify me of the patterns when you write them out. I need to follow a pattern. Please add me to your list thanks! I have made a few dishcloths but I do not like to use them as they are too heavy and they seem to take forever to dry in between uses. Any sugggestions? I’ve put them in the microwave while they’re wet to speed up the drying time AND it kills the bacteria! Jan, i am new to crochet, and started out a few months ago, practicing my stitches my making dishcloths. Mine seemed big and heavy at first too. So i started making them only as big as my hand as it was stretched out. around 6.5 or 7″ square. I have a double sink so my wet cloth hangs over the sink divider. I will give this a try. Thank you for the idea. I still have a few colors of cotton yarn left so I can try it soon. Thanks. 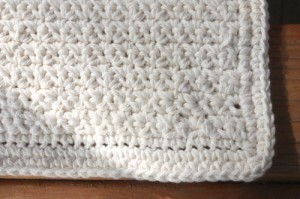 Hi Jan, I can understand how they can be too bulky and that using a yarn such as Sugar’n Cream can give you this result. But I actually DO have a suggestion that may work (that I actually JUST discovered this week!). I was wanting to make some crocheted flowers for a special item and was looking through my stash of yarn to see what would work. I didn’t want them to be thick and bulky, but thinner and drapier (is that a word? lol). Anyways, I came across some string that I had purchased at a hardware store some time ago. It’s probably half the thickness of the cotton yarn. The result was beautiful! Just the right thickness! And it’s cotton, which washcloths need to be. The downfall is that you will be limited to the colors of your washcloths (maybe you can dye them?) and they’ll take a little longer to make since you’ll be using a smaller hook – therefore a smaller stitch, and more stitches to make one cloth. But I believe the end result will be what you’re looking for! Let us know if you try this! Interesting suggestion. I’ll have to see if I can find any of this kind of string. Thanks. Thank you so much! I”m a believer in “less is more”. Hi! I love your dishcloths, they are so pretty! Would love to have your patterns 🙂 I am a lefty and taught myself to crochet and always want to learn new projects! 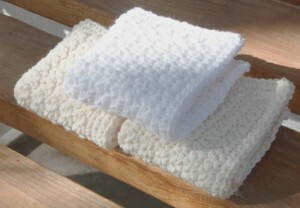 Hi Sharon, Thank you for the compliment – I’m so glad you like the washcloths! The patterns should be posted tomorrow. Teaching yourself to crochet as a lefty is quite an accomplishment. I taught students to crochet left-handed and I’m right handed. It was a challenge, for sure, but forcing myself to do it gave me a different insight into this craft. unexpected company this Christmas season. Thank you for the compliment and Thank You for visiting crochetspot.com. The pattern should be available tomorrow. Let us know what you think! crochets to fix that. I am tired of this stitch and look forward to trying these simple patterns. Thank you so much for this wonderful idea. I am going to make a bunch for Christmas gifts for those “hard to buy for” people and add a bar of soap (maybe Burt’s Bee’s). This is perfect and will be quick projects. Thanks again! Adding the soap with the gift is an excellent idea! I made a lot of extras last year for those that happened to drop by over the holidays – they are a great “last minute” gift for anyone. I’m so glad to have you as one of our readers! I’m guessing you’ve probably seen many changes in this craft over the years (as I have!). Is there anything you’d like to see make a comeback? Let us know! Great idea! I just gave this set to a friend who just moved back in town. She was delighted (and of course I tied the ribbon around it for that extra flair!). Hi, My Mother-in-Law has a very very old crocheted washcloth type item that she uses as a pot holder. Her mother made it for her many many years ago. It looks just like a regular crochet washcloth but its a really tight crochet and made with very thin cotton yarn (almost string like). Have you ever seen or made one? I am not sure what type of yarn/string it is? I wish I had a picture to send you. Any suggestions? Penny, this could be crochet cotton thread (very readily available at Michaels, Joann’s, etc. in many different colors). There are 2 sizes to this thread (I believe they’re size 3 and 10). Size 10 is the thicker of the two and that’s what was probably used in your Mother-In-Law’s washcloth. Using a very small-sized hook, you’d get a fairly tight stitch. This is also the type of thread used to make doilies. They would take a bit longer to complete and would definitely need more stitches than the ones in this article, but I’m sure the result would be amazing! Can’t wait for the patterns! I want to try each one, and I love the idea about trying the string for a flower. Thanks so much for all your idea’s and patterns. I am a beginner and these look like a great beginner pattern, but the finished design looks very professional. What’s not to love about these?!!! Thank you all so much for your compliments! The pattern will probably appear on this site tomorrow so come back to check for it! Let us know how they all turn out! Love your washcloths. I have been experimenting with different stitches also. I love how they all turn out so different, but your are truly lovely. I too am a cotton lover. I’ve made some dishcloths and have been very pleased with the result and they are so absorbent.. Yours look so neat just with single crochet so am going to make some more for Christmas presents for my sisters. Thank you for inspiring me. I think its nice when people are willing to share patterns, sometimes you see something and would like to make it but the person won’t share the patten, I think if I make something and someone wants to know how I made it, I take that as a compliment. Thanks so much for sharing. 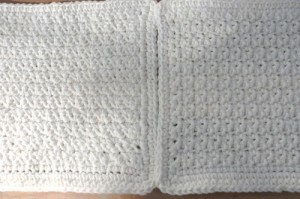 I’ve been making washcloths and dishcloths for a while now, and I agree that simple is better. For washcloths, spa cloths, makeup remover pads, I prefer ” I LOVE THIS COTTON” by Hobby Lobby; it is just SO SOFT! Also have done a pattern with size 3 thread doubled and it was great. But for a dishcloth, I prefer “Peaches and Cream” or “Sugar and Cream” (both now made by the same company, but one is Canadian made.) But if you want a “pot scrubber”, your classic, cheap, acrylic yarn is a good deal – The scratchier the better. Love the patterns shown, and Burt’s Bees Products are always great to add. Also like Yardley’s Lavendar. I have never used this yarn before but you’re the second person to mention it to me – I’m going to HAVE to find it! I use cotton whenever I feel it’s appropriate. I love the feel of it and how it makes my stitches look so defined. Thanks for sharing! 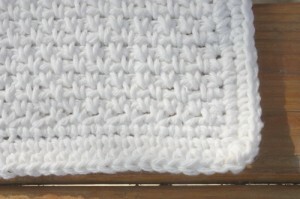 Try the varigated cotton yarn – for your dishcloths – I like it better than the plain colours … look cleaner longer. Like your idea of just using a single crochet with a chain – am going to the hospital tomorrow to wait while hubby has some tests so will try it out. Finished one there today with a star pattern. Love making them. OOPS. I was saying before I pushed the wrong key, that the label for I LOVE THIS COTTON says it is made in Turkey for HOBBY LOBBY. Hi, I too am a lefty and i’m not very good at following patterns, but your explanations are great. My mother, right-handed taught me to crochet when I was young I just had to mirror what she was doing because she couldn’t grasp left-handed crocheting and I couldn’t do it right-handed lol. I’ve always just used acrylic so I look forward to trying cotton dish clothes very soon. Thanks. Samples make great washcloths and vice versa. Hi Veronica! At the bottom of the post, there is a link to the patterns, they are free on the blog. Another nice variation is to crochet 3 sc front loop only, 3 sc back loop only, maintaining for 3 rows (depending on number of stitches across, row 2 may be worked reverse of row 1, so that stitches are on same side of washcloth for 3 rows) to create a small basket weave stitch. Similar to the front/back sc stitch cloth, but a bit bolder pattern.